These days, our computers are used for so much more than just word processing and game playing. Most of us also use our PCs and laptops to store our various media. So your computer becomes a jukebox or a digital photo album. And if you are like me, those media files might be spread out in a few different places. All of our photos over the last 8 years were stored on my old laptop. When that started to go, I backed them all up onto an external hard drive. So now I have some photos on my new laptop and all of them on the external drive. Than throw my iPhone into the mix which has over 300 photos on it. Like I said, media files scattered everywhere. 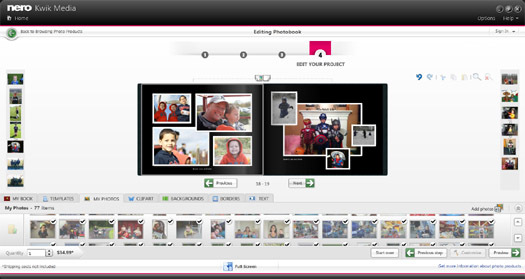 Nero Kwik Media is a free Windows-PC application that allows you to organize, edit and share your photos, play music and video, post you photos and video to Facebook and other social media sites and even order photobooks and other quality photo products. I am all for making life easier and was ready to give this a try. Downloading the application took me about 20 minutes via our DSL Internet connection. While downloading, the application also notified me that it would need to install certain Windows programs and updates to continue. Look at all of those photos! Once it was downloaded I opened it up and started playing with it. It is pretty user friendly and intuitive and after just a few minutes, I really had the gist of how it worked. As I mentioned, my photos are stored in a few different places so I got to work telling Nero where to look for my photos. I showed it the two folders on my external hard drive, "Canon" and "iPhone photos" to pull photos from. Between those two folders that is about two years worth of photos and they loaded rather quickly. You are then able to arrange your photos by folder name, year, month and day. 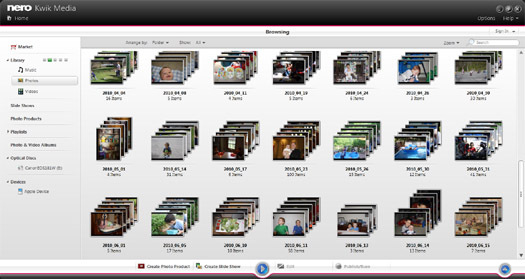 I personally like sorting them by month because then it keeps all images from say September 2011 together. 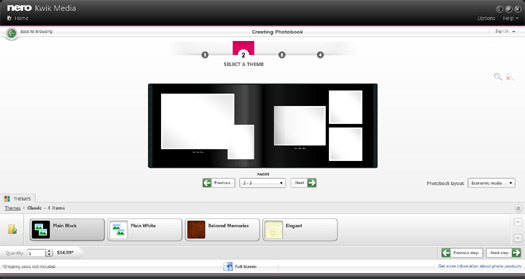 One of the nice features of Nero is you have the ability to create photo products right there within the application. 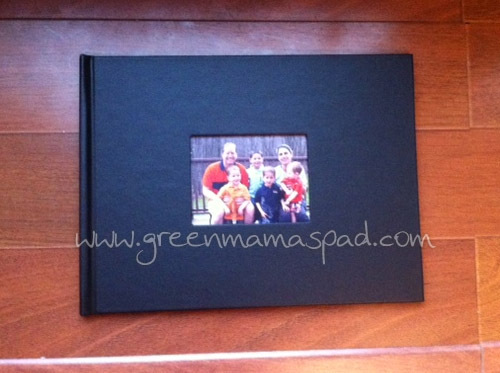 With the holidays just around the corner, many people like to create photobooks to give the grandparents or other close family members. I decided for my photobook that I was going to put together a book of various pictures from throughout the year to give to my husband. (Luckily, he doesn't read my blog). When getting ready to start a photobook or other project, I highly recommend that you first browse through your photos and mark any that you would like to use as a favorite. I will explain this in a moment. 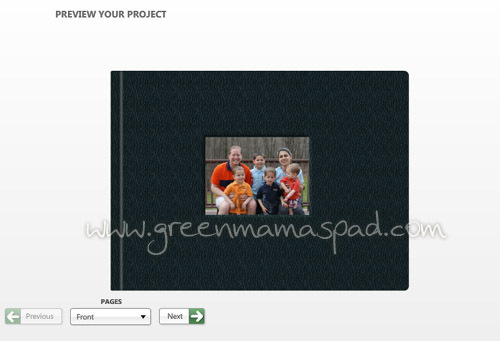 You will first be asked to make some selections for your photobook, like what type of cover and theme. I went with just a classic "plain black" theme but there are several fun ones to choose from like baby and occasions. The next step is selecting the photos to include which brings us back to my point about using favorites. I found selecting photos within the project to be quite tedious as they are only displayed in thumb nail size. However, I noticed there is an option to just import all of your favorites which goes much, much faster. So i went back, added over 60 photos to my favorites, then opened up the project again and imported them in. Much better this way. What I absolutely loved is that Nero automatically populated the book with all of my photos. I thought I was going to have to place them one at a time so this was an awesome surprise. I then went page by page making sure I liked the order, checking to see if the photos looked OK. There were a handful that needed to be adjusted and there were a few I swapped places, but for the most part I stuck to what Nero did because I really liked it. You can also add text and clip art to your pages here, but I had decided that I didn't want any of that, just photos. Once you finalize your images you will then need to proof it to make sure there are no mistakes and then go ahead and submit it. They do take PayPal which is a huge plus for me. I get frustrated when online stores don't. I went ahead and placed my order with standard shipping and was done with it. Now it took me a while to get the book done, but that was because of countless intrruptions from the little people in my house. Left alone to do this I would say it would take at the most 30 minutes. I ordered my photobook on Saturday night, November 12. It arrived on my doorstep, via UPS, on Thursday, November 17. Now that is a fast turnaround if you ask me! Just 5 days to print it and ship it - and I ordered it on the weekend. That is pretty impressive. I opened up the package to check out the photobook and I am very pleased with it. The leather cover is really nice and I like that the book is thin and not at all bulky. The quality of the photo printing inside is really top notch. The only thing I was not happy with was the photo for the cover. Even though the project shows it perfectly centered, it is not in the same position on the final project. Preview when I submitted my order. Final cover. You can see the photo has shifted to the right. Overall I think that Nero Kwik Media is a very useful application. I like that I can browse through all of my photos in one place despite the fact that they are located all over on various devices. 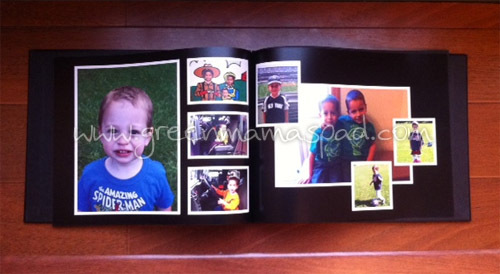 Creating the photobook was really easy and the result is a lovely book that would make a nice gift for anyone. And don't forget that Nero Kwik Media is not just limited to photos, but you can also navigate through your music and videos as well. Disclosure: This post is part of a SocialMoms product evaluation, for which I’ve been selected. One free photo book was made available to me for review purposes. I’ve been compensated for my time with a $100 PayPal payment. The opinions expressed in this post are mine and don’t necessarily reflect the opinions of SocialMoms or Nero.